I shot my first hare last weekend... in a grumpy fit at not seeing any deer in three days! 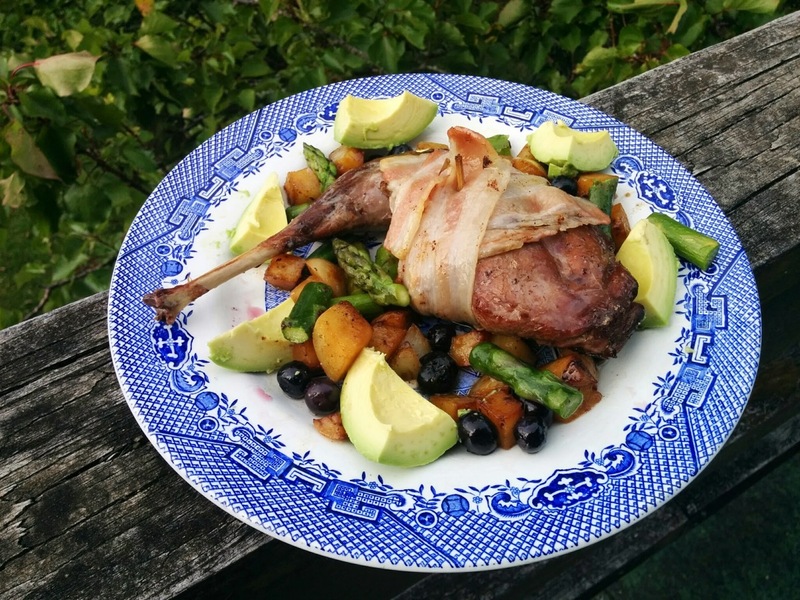 I roasted it for dinner tonight after getting some ideas from the hare saddle fillet recipe in 'A River Rules my Kitchen', mostly the honey and berry part. I didn't have blackcurrants but blueberries worked well. It was excellent, very tasty although I should have aged the hare for a few more days. It was pretty tough, but I don't really care... good for the teeth! Melt the dripping in a pan and baste the hare all over with a brush, then wrap with bacon and put in the oven covered in foil. Melt a tablespoon of honey in a saucepan with the berries and a quarter cup of white wine. Just warm enough to melt but not boil or burn. Cut the potato into dice sized cubes and half deep-fry in dripping. I used a pan that had venison cooked in it earlier today which gave it an excellent flavour. But you could also use gravy. Once the potato is soft tip the chunks into the oven tray with the half cooked hare and replace the foil. When the hare is done how you like it pour the berry/honey/wine sauce over it and remove the foil, then let it bake for a few minutes to crispen up. Lightly boil/steam the asparagus, tip off the water and throw a tablespoon of butter plus salt and pepper in the pot. Let it melt for a minute then shake it around with the lid on to cover the asparagus nicely. Then tip it over the hare. Throw some diced avocado over and serve. Last edited by brodster; 07-01-2015 at 10:49 PM. veitnamcam, EeeBees, Toby and 2 others like this. They're all over National Park. I spotted or spooked easily half a dozen! Slow roasted mutton (or lamb) with red currant and chili glaze. Recipe for Raging Bull: Roasted pork loin with homemade bbq sauce. All times are GMT +13. The time now is 05:19 PM.